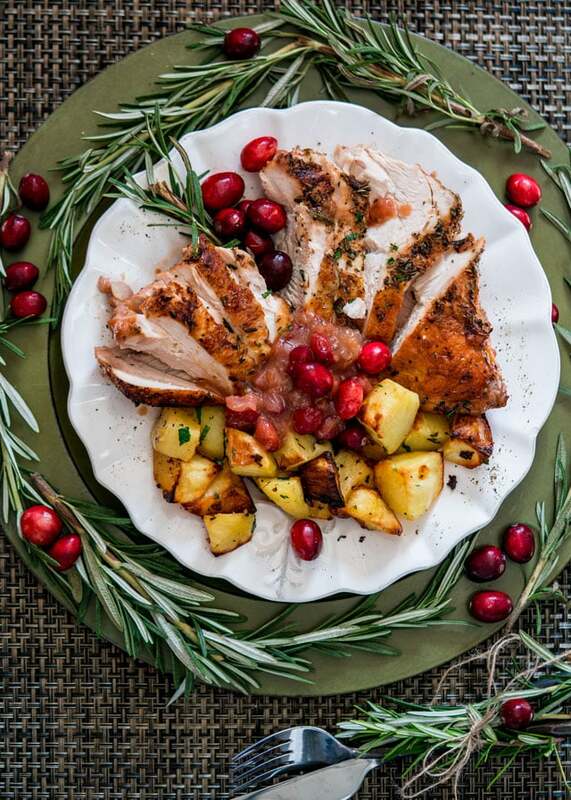 This Roast Turkey Breast with Saucy Cranberry Sauce is your answer to a stress free holiday and a great alternative to cooking a whole turkey. This past weekend we had our Thanksgiving here in Canada and this is what I made. Let me tell you that cooking turkey breast is your answer to stress free holiday cooking. This recipe is perfect especially if you’re only cooking for a few people and don’t want to cook a whole turkey and end up with tons of leftovers that you have no idea what to do with. 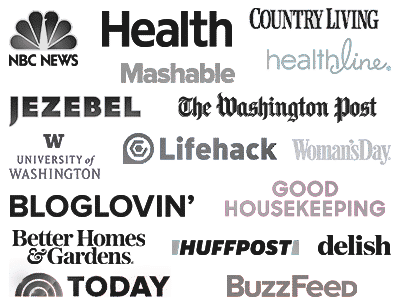 With the holidays quickly approaching you want to make sure you have delicious and easy recipes, because when the big day comes we need all the help we can get. The beauty of the roast turkey recipe is that you can also make it in a crockpot, so check out the Notes section of the recipe for crockpot instructions. 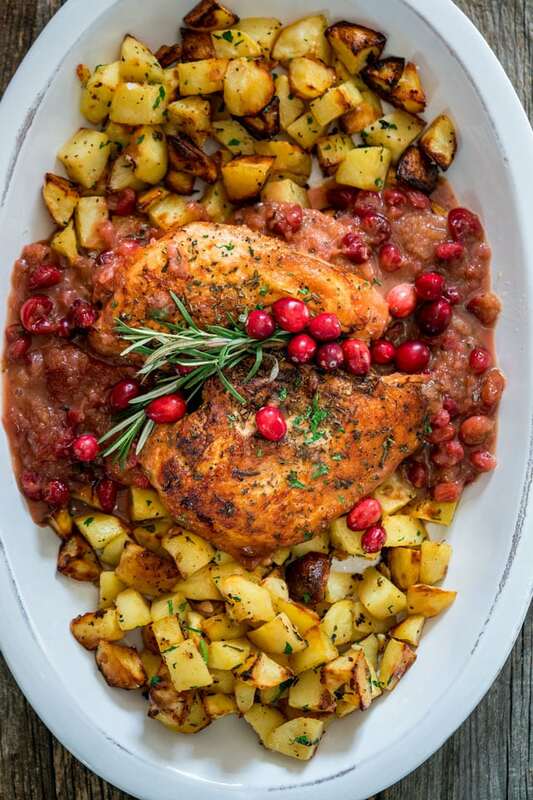 I love the idea of making this in a crockpot because it frees up your oven, and you know you’ll be needing it as much as possible on Thanksgiving day. 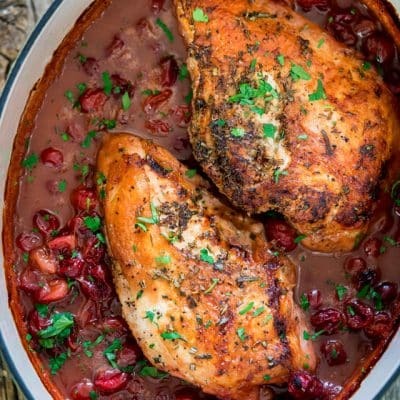 Besides the simplicity of this recipe, I really love this cranberry sauce, it’s sweet but tangy and well the obvious reason is that it pairs magnificently with this turkey breast. As far as the turkey breast goes, I’d recommend going with a breast with the skin on for a bit more flavor but skinless works just as well, not to mention it will be a bit healthier. You’ll need about 4 lb of turkey breast here, mine came in two pieces, but sometimes you can find a whole piece and it may have the bone in too, which is fine. I served mine with some roasted potatoes but you could pair it with green beans or mashed potatoes, whatever your favorite Thanksgiving sides are. 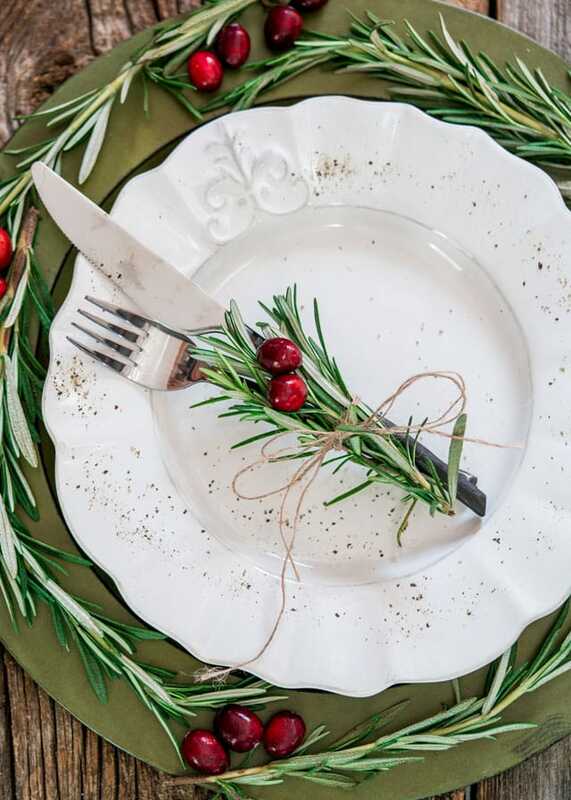 I don’t normally do table decorations, but I loved the idea of doing one for this dish because of the ingredients here, rosemary and cranberries! They are perfect for decorating. If you guys love this turkey recipe and try it yourselves, please let us know. Take a picture and tag it #jocooks on Instagram so we can see it. I always love to see what you guys come up with! 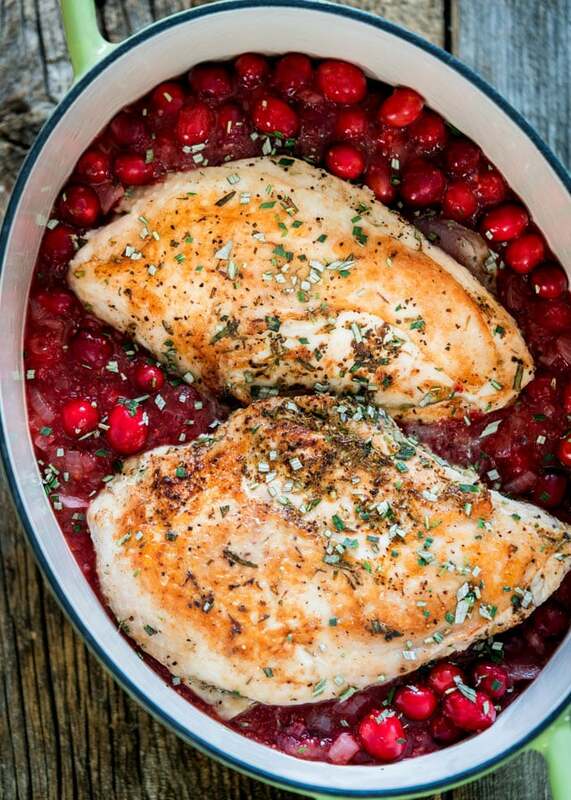 This Roast Turkey Breast with Saucy Cranberry Sauce is your answer to stress free holiday and a great alternative to cooking a whole turkey. * In a food processor add 2 cups of the cranberries, orange juice, apple jelly, five spice and cornstarch. Pulse a few times until smooth. Set aside. Season the turkey breast with the rosemary, thyme, salt and pepper generously. In a large skillet melt 2 tbsp of the butter. Add the turkey breast and brown on both sides until golden. Place the turkey in a roasting pan that's big enough for the breast. I used a 5 qt Dutch Oven. In the same skillet melt the remaining 2 tbsp of the butter. Add the onion and cook for about 5 minutes until it starts to brown and becomes soft and translucent. Season the onion with salt and pepper. Add the cranberry mixture to the skillet and bring to a boil, stirring occasionally. Remove from heat and stir in the remaining 1 cup of cranberries. Pour the cranberry sauce around the turkey breast, you can pour over the turkey breast too, but I like the turkey breasts to be nice and golden when done. Place the roasting pan in the oven and bake for about 1 1/2 hours or until the internal temperature of the turkey breast is at 165 F degrees. Remove the roasting pan from the oven, cover with aluminum foil and let it rest for 15 minutes before slicing the turkey. Serve with sweet potato casserole, green been casserole, mashed potatoes or roasted potatoes. Crockpot Alternative: Follow all the steps up to and including step 6, but instead of placing the turkey in a roasting pan, place it in a slow cooker and pour the sauce around it. Cover and cook on low for 4 hours. Check the internal temperature and make sure it's at 165 F degrees, otherwise cook it longer. 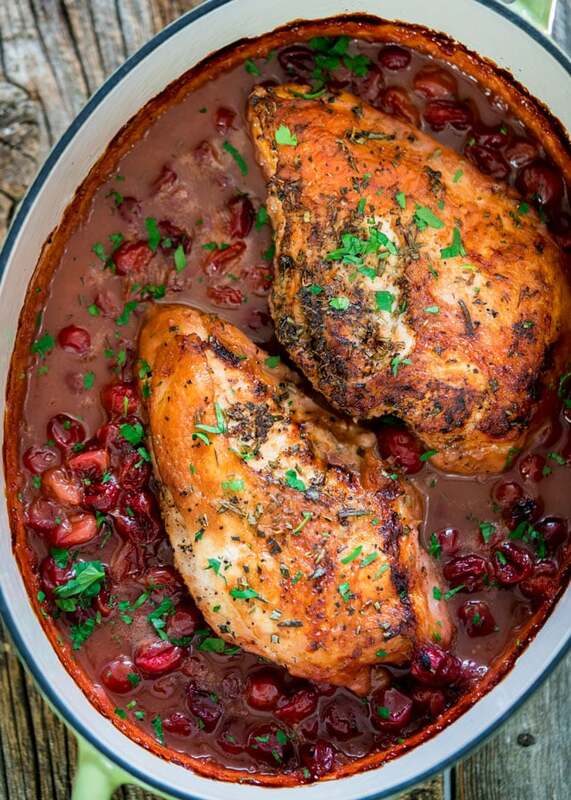 A 9 x 13 roasting pan will also work for this recipe. "Five Spice" is a blend of five powdered spices which would typically include cloves, cinnamon, star anise, peppercorns and fennel seed. You can find this already prepared at your local grocery store. *If you do not have a food processor, just stir everything together in a sauce pan and cook it down for about 5 minutes until the cranberries soften a bit. Easy and had great reviews. I loved getting two moist turkey breasts plus rich gravy with NO effort! What roasting pan would you suggest for this? Can I roast in a cast iron skillet? You can use a cast iron skillet, or any roasting pan that’s big enough to fit the turkey breast, 9×13 should be just fine. This would certainly be terrific in a crock pot. We suched as the sauce a lot we thought we would make it as our own version cranberry sauce to use over and over as it was so great. Many thanks for the recipe. I love this idea – 2 in one, plus the sauce is flavoured with the turkey juices! We’re in sync, I’m planning to do a dressing + breast baked in the same dish, making it next week, can’t wait!!! I know, isn’t it great! Can’t wait to see your version. Hi what is 5 spices? Five spices is a blend of five powdered spices which would typically include cloves, cinnamon, star anise, peppercorns and fennel seeds, but you can buy it already prepared and it’s called five spice. 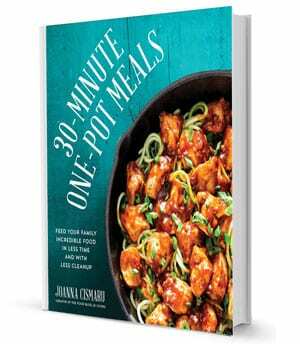 I am definitely making the crockpot version when I go up to Ottawa In a couple weeks to my daughters place. Perfect to come home to after some serious shoppin. YUM!! This would be great in a crock pot. We liked the sauce so much we thought we would make it as our own version cranberry sauce to use again and again as it was soooo good. Thanks for your comments, we really love to hear from our followers.